Their Market is Dead: “Early” Commemorative Silver Half Dollars Can Now Be Bought For “Pennies on the Dollar”! In my last column I wrote about “early” United States Mint commemorative coins struck between 1892 and 1954. These are legal tender silver half dollars, struck by the U.S. Mint, which also include a silver quarter from 1893 and a silver dollar from 1900, as well as 11 $1 and $2 1/2 gold coins, and two high-priced $50 gold coins. In this week’s column I cover additional information about their current and historic market prices. When do you want to buy a coin investment? When prices for a series have already started to rise…or when a series is dead? 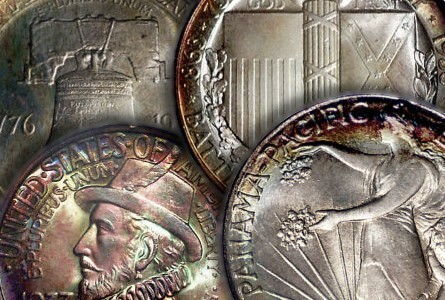 Right now some of the “early” U.S. legal tender commemorative silver half dollars can be purchased for about 10 percent of what they were at their all-time market highs, way back in 1989. That’s right…just 10 percent OF their highs! Do you think there’s potential with this series?! We’re not talking about a cheap stock investment for a business that’s about to go under. No…these are solid, collectible legal tender silver half dollars struck at the U.S. Mint. Can their prices go any lower? What do you think? Personally, I don’t see how they can. All I see is upside. When more investors realize this is a series to collect for fun and profit, and start buying, their prices will begin to climb. And when this happens, more and more coin dealers will stock more of these coins in their inventories, further fueling the market to seek higher price levels. So get a head start! A collection/investment of these coins will take time to build. Start right now! This series has the potential to not only double or triple, but heck, some coins in this series have been TEN TIMES higher than what their prices are today! When will prices for these commemorative silver coins start to rise? Of course, nobody knows. It’ll be event driven…probably economically influenced. It’ll probably take higher employment, or it could be higher inflation. It’ll take collectors and investors buying en masse to move this market. But, a market stimulus could come in the form of dealers, like myself, taking inventory positions in these coins and promoting them to collector/investor customers. Prices advance through higher auction sales prices and through higher dealer bids on the wholesale trading networks. This’ll be caused by demand – both from dealers building inventory and collector/investors building sets. So what are the right commemorative coins to buy? There’s no one answer to this question, because when this market segment begins to move higher, prices will likely rise as a series on the whole. But the basics of the “early” commemorative series are the 50 piece type set, which is one coin of each design type, and the complete 144 piece set, which includes all the different varieties and mint marks. There are also 11 small denomination gold coins, plus two high-priced $50 gold commemorative coins, one octagonal in shape, and the other round. Smaller collections with specific themes can also be built. For example, there are several issues that pertain to the Civil War; there are various personalities that are depicted on some of the coins; geographically themed commemoratives can make up a set; or even a set of all the years and mintmarks of the Oregon Trail issues, for example, can make up a collection. Then there are the Centennial, Bicentennial and Tercentenary themes. Or, of course, you can make up your own themes. So, subsets can be built that are less costly than a 50 piece type set, or 144 piece complete silver issue set. The cost of a 50 piece silver type set of commems in the Mint State 66 grade, which is what I am recommending for investment purposes, will be somewhere between $110,000 and $130,000 at this time, while a 144 piece collection should cost somewhere between $200,000 and $225,000. A Mint State 65 collection/investment should cost somewhere between $50,000 and about $65,000 for the 50 piece set, and the 144 piece collection should cost between about $90,000 and $110,000. A 50 piece MS 64 set, which is still an attractive grade, may run somewhere between $25,000 and $35,000, while an MS 64 144 piece collection should cost between $45,000 and $65,000. However, the market is very soft for these coins, so it’s a great time to negotiate for the best prices. Complete 50 piece or 144 piece collections are seldom available on the market. Most people will have to build one to get one. This could take a few years, or just a few months or less, depending how quickly a collector/investor wants to come up with the money and on how fussy one is in quality. Most of the coins should be readily available, except when getting into the MS 66 grade there are a few that may be challenging to find. For some of the issues there are just a handful of pieces graded this high, especially when verified and stickered by CAC. Those originally graded by PCGS sell for the highest money. But some people prefer the white backgrounds of the NGC holders, and those are usually available in the same grades as PCGS graded examples for less money. When getting into the PCGS or NGC Plus graded examples, again those will trade for more money, and people who take part in the Registry collecting programs of the grading services may want to go for those coins. The best data on the price history of early commemorative coins is from the Coin Dealer newsletter (known as the Greysheet) and the Certified Coin Dealer newsletter (known as the Bluesheet). These are wholesale price guides used by virtually all coin dealers across the country. The prices represent “bid” levels that dealers are paying for these coins over the coin dealer trading networks. There is also an “ask” price in the Greysheet, but the market most often refers to prices in terms of “bids.” Greysheet prices represent coins that are solid for the grade, while Bluesheet prices represent prices dealers are willing to pay on a “sight-unseen” basis for even the bottom of the barrel coins that just make the grade. As a retail collector/investor you should expect to pay a premium to cover a dealer profit over what these coins for on at the bid/ask levels. However, as I previously stated, commems are in a down market right now, so they’re ripe for negotiations to get the best prices. Below are the bid prices for the 50 piece commemorative type set from the ultimate market high, set back on June 2, 1989, and today’s prices, 22 ½ years later. Do you think these coins have potential? Just look at some of them – they’re now just 10%, or even less than 10%, of the prices they reached during their 1989 highs! Please note that the Greysheet did not list MS 66 prices back in 1989, therefore, I’ve included prices from both the Greysheet and the Bluesheet. Have fun browsing these lists!